By H. Joe Bohn, Jr., Ph.D., M.B.A. and Ahmed Alotaibi, M.S. In the Spring of 2014 two doctoral students embarked upon the journey of knowledge acquisition in Dr. Jim Taylor’s Governance and Leadership class. Taylor, an accomplished healthcare executive, former CEO of UofL Healthcare, and doctoral graduate (DMan) from University of Hertfordshire, UK has over 30 years of community and academic hospital leadership experience including serving on multiple non-profit governance boards of directors. 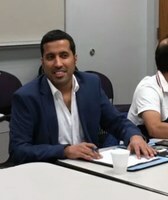 As for ourselves (Joe Bohn, now visiting assistant professor and director, community engagement at the USF College of Public Health and Ahmed Alotabi a doctoral candidate in the Department of Health Management and Systems Sciences), we were colleagues from East and West. One of us entered the Ph.D. program as an entrepreneur, with no aspirations of teaching down the road (focused more on an industry career track), and the other a full-time lecturer and administrator at King Saud University in Riyadh, Saudi Arabia with background in emergency response services (EMS) in the Saudi nation. At the beginning of this class, Alotabi had the wherewithal to recognize the need to form a discussion group to process and expand upon understandings of the extensive list of classic materials to be read and intellectually digested over the coming months. He approached a number of colleagues and within the first week he and Bohn decided to commence a regular Sunday afternoon study session. Over the next 12 weeks, every Sunday afternoon, 2-3 hours were spent reviewing and discussing the works on complexity science from Dr. Ralph Stacey; organizational theory from Gareth Morgan, systems perspectives from Peter Senge; and the study of culture from Clifford Geertz. With one of us being from the City of Shively here in the heart of Louisville, KY and the other from Saudi Arabia, capturing the essence of meaning and purpose to carry forward from these intellectual giants proved challenging but worth the time invested. The semester concluded with good grades but the experience of strengthening camaraderie between colleagues and the deepening of our understanding of these scholarly works has proven to be one of the most worthwhile takeaways from the doctoral program. Since its completion, Bohn received a first teaching assignment at USF, which was to focus on systems thinking tools and theories. Little could be foreseen of the transformative impact of the work done in Taylor’s class and how it would start to shape a level of expertise to support “transforming public health practice” in the future. A new focus on systems perspectives, complemented by complex responsive process theory, and complexity science related topics would help shape an academic focus. Helping students and a public health academic program meeting new CEPH competency requirements for ensuring “systems thinking skills” are strengthened for the DrPH students at the University of South Florida. This effort commenced over a period of four weeks in fall 2016 for a first module taught on systems thinking to the college’s new cohort of DrPH students. Leveraging some of the materials covered in Taylor’s class, along with additional insights on institutional theory learned under Dr. David Roelfs from UofL’s Sociology Department in dissertation work, a course module was developed that proved to be provocative and rewarding. For Alotabi, the future holds great promise for taking an existing course on leadership being taught at King Saud University. Upon completion of his doctoral degree he will return to King Saud assuming responsibilities to take over this course or structure a new course on leadership in national EMS activities. For this, he has communicated with his college leadership about the rich value of the material covered in Taylor’s course and plans will be made to incorporate readings and concepts into a new leadership course in the future at King Saud. The works of Dr. Ralph Stacey and Reuben McDaniel on complexity; Norbert Elias on sociology; Peter Senge, Robert Greenleaf and John Kotter on elements of the leader’s role in an organization; Gareth Morgan on the different ways of viewing organizations; and the importance of the collective mind concept from Weick and Roberts, are a few of the critical takeaways and key readings with timeless value that will enrich the learning environment for years to come—helping bridge a civil society and public health informed agenda in the 21st century. Perhaps the answer lies in this simple example of two colleagues in a small cohort of doctoral students, one from the East and one from the West. Focused for a period of time on strengthening intellectual prowess, and capacity to better understand tenants of leadership and governance. Moving forward with an understanding that in the local interactions we encounter and can take part in, we have new found knowledge that emerges to strengthen those weak ties in society and to help future students make the mental connections to such timeless concepts that will help them improve the health of their communities for years to come.